Photo: This picture of our "Lorenzenmobile" was taken back in January not long after I wrote my first post about our van (check out the link to read a cute story). 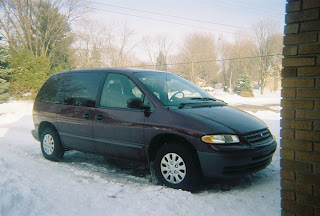 I returned home safely at about 5:30 p.m. this evening after spending an exhausting four hours driving during the hottest hours of the day in the vehicle my son calls "The Lorenzenmobile." Driving is one of my least favorite activities, but I'll drive longer distances when absolutely necessary. It was necessary today because my husband had to be somewhere for a work-related responsibility at 5:30 p.m. Unfortunately the Lorenzenmobile is slightly older than my nine-year-old boy. The breaks, despite being recently "repaired," squeak horribly. Worst of all, the air conditioning gave out last year. We tried a very expensive fix, but to no avail. So, I sweltered a bit in the 84 degree plus heat. My son seemed to fair a little better, but maybe it was because he was excited about our destination--Summer Camp!. Fortunately, unlike when that photo was taken, the roads were really clear. Well that is except for the road construction that sent me on a brief detour on my way home. Today I dropped my son off at what he had been calling "boarding school camp." He started getting excited last night and was really happy this morning. Unlike Max's Place (see my last post), this camp is designed for outdoor learning. A special education teacher with cerebral palsey started this camp 50 years ago. The camp and (to my knowledge) the founder is still going strong. This week my guy will be swimming in the lake, going up to the handicapped-accessible tree house, riding horses, and feeding animals along with a lot of other camp-like activities. On Sunday night (probably a couple of hours before the writing of the post took place), campers probably made s'mores. In my son's eyes, one hasn't gone camping until the s'mores (some chocolate and a roasted marshmallow sandwiched between two graham crackers) have been made. Lucky for him, it's a first-night tradition at The Fowler Center, where my guy has been going since the age of six. This is his fourth time going to summer camp, which makes him one of the youngest "regulars" amongst the ages 6 to 20 crowd that is at camp this week. Most of the staff know him pretty well and it was pretty nice to hear many of them call out to him by name. P.S. My five-year-old son stayed at a trusted babysitter's home and was able to go paddle boating and play with toys that were new to him! Good luck with picking him up in a new car. M gets very upset with us if we change anything like that with no warning. Ugh. We sold a car not too long ago and she still talks about it like we dumped off a family pet. Argh. Hopefully he will be excited for the car!